2 Bedroom End of Terrace House For Sale in Torquay for Asking Price £165,000. 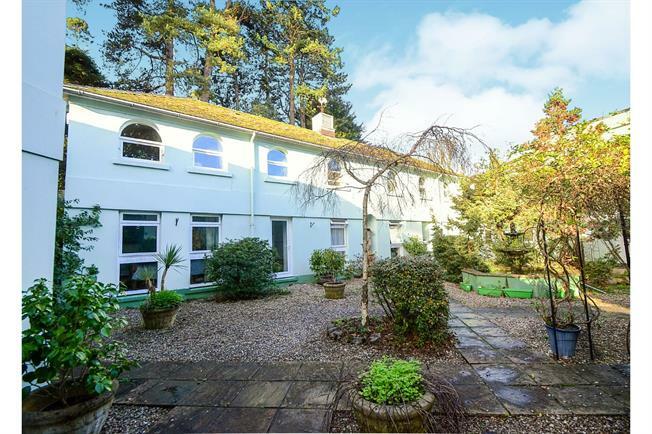 Being situated in a secluded position of Chelston and just a short distance from Torquay sea front as well as Torre train station, a lovely end terrace home that would be ideal for a first time buyer, someone looking to downsize or as a holiday home. The accommodation is reverse level and includes an entrance porch, open plan living room/dining room/kitchen, two bedrooms, utility room, shower room, part double glazing, night storage heating, patio garden and parking. Door to living area, fuse box. Fitted with a range of wall, base and drawer units with work surfaces over incorporating a stainless steel sink unit, electric oven with electric hob and extractor over, spaces for appliances, part tiled walls, attractive arch window overlooking the communal courtyard. Built in wardrobe, laminate flooring, night storage heater, double glazed door to the communal courtyard. Two double glazed windows, night storage heater, wardrobe, laminate flooring. Fitted with a double shower cubicle with electric shower, pedestal wash hand basin, WC, extractor fan, part tiled walls. Space and plumbing for washing machine, spaces for further appliances. To the rear of the property there is an attractive communal courtyard which is mainly laid to patio with various borders housing shrubs. To the front of the property there is a patio area with a wall surrounding and built in store. There is also ample parking in two locations.